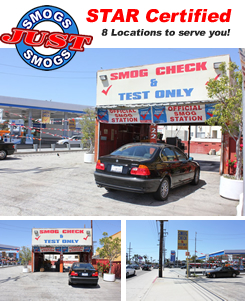 $15.00 Off Venice Smog Check Coupon - Smogs Just Smogs - 2422 Lincoln Blvd., Venice, CA. Phone: (310) 821-2451. Local Venice Smog Station. Save Huge! Get $15 off our already low price smog check! We're STAR certified and smog check all vehicles. We only perform smog inspection, hence the name, Smogs Just Smogs! No repairs, no rip offs. Just simple, quick and accurate smog tests. Specializing in getting the job done clean. You can rest assured your car, truck, SUV or van will be returned to you in its original condition. No fingerprints, no grease, no hassle. 8 Locations to serve you and all are licensed by the Bureau of Automotive Repair to inspect STAR, regular & gross polluter vehicles. Shop Hours: MON-FRI 8:30am to 5:30pm. SAT - SUN 9:00am to 4:00pm. Smog Special: Get $15.00 Off our regular smog check price with your SmogTips coupon! More certified smog station near Venice, CA.